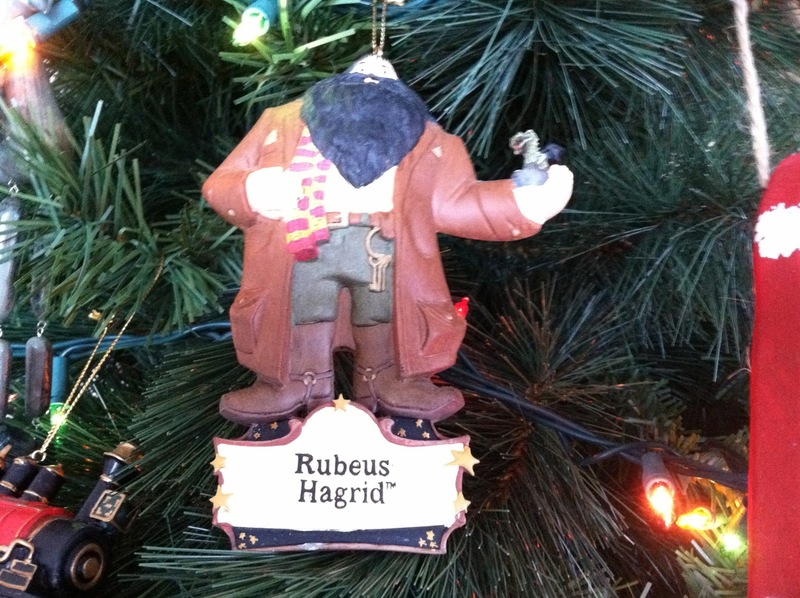 Today, I’m looking at Christmas memories surrounding the first two Harry Potter films, “Harry Potter and the Sorcerer’s Stone” and “Harry Potter and the Chamber of Secrets.” You'll even get to see some pictures of two AWESOME "Harry Potter" ornaments. What are you waiting for? ““Harry Potter” as a Christmas movie? What is this heresy! ?” you may ask. No, “Harry Potter and the Sorcerer’s Stone” and “Harry Potter and the Chamber of Secrets” are not Christmas movies by most stretches of the imagination. They are instead great movies to watch at Christmas, a subtle but important distinction. 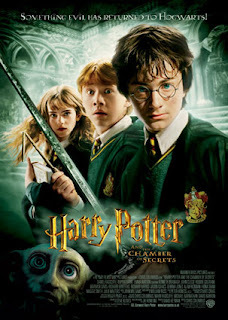 There’s a general atmosphere about the films that make them perfect December movies, and while I enjoy watching the “Potter” films at all times of the year, I often find myself breaking out the first two films during this season. Part of it has to do with nostalgia; the films were originally released in mid-November 2001 and 2002, and since I saw both films many, many times in theatres, they were simply a Holiday season fixture during both of those years. In fact, I’ve always associated both of these movies with snow, and though I’m not entirely sure why, my distinct memories of running from the car to the theatre in icy slush probably has something to do with it. To this day, watching these movies just doesn’t feel right unless there’s snow falling hard outside and a fire roaring next to the TV. But it’s not just the original release date; if it were, then “Goblet of Fire” and “Deathly Hallows Pt. 1” would also both be Christmas classics, and I think it’s safe to say I don’t associate Dobby bleeding to death from a violent knife wound with Rudolph the Red-Nosed Reindeer. No, there’s something about “Sorcerer’s Stone” and “Chamber of Secrets” that just feels festive, and if anything, that feeling has only intensified over the last ten years. These were the Potter films directed by Christopher Columbus, and his family-friendly aesthetic certainly contributes to the Holiday mood. Warm, rich colors, lots of reds and greens, many shots of roaring fires, etc. Hogwarts itself is a rather festive setting, at least in these early films, with its charming, inviting corridors, pleasant brick structure, and thoroughly cozy atmosphere. This is a place I would love to vacation at for Christmas (well, actually I would love to live there and go to Wizarding classes and meet Dumbledore and go to Honeydukes why oh why didn’t I get a letter when I turned eleven, I…..oh, I was rambling…er…ahem…let’s put the other parenthesis in place…okay, press the shift key, and…here we go). Columbus’ style is far from revelatory – visually, these are easily the least interesting Potter films – but it is warm and amiable, and he infuses every frame of both movies with a strong sense of awe and wonder. It’s the same bag of tricks that made his 1990 film “Home Alone” a Yuletide standby, and even though only the middle portions of these “Potter” films take place at Christmas, they both make for wonderful December viewing. Of course, one of Columbus’ secret weapons on “Home Alone” was John Williams, and I don’t think I need to explain the brilliance of Williams’ first “Potter” score. 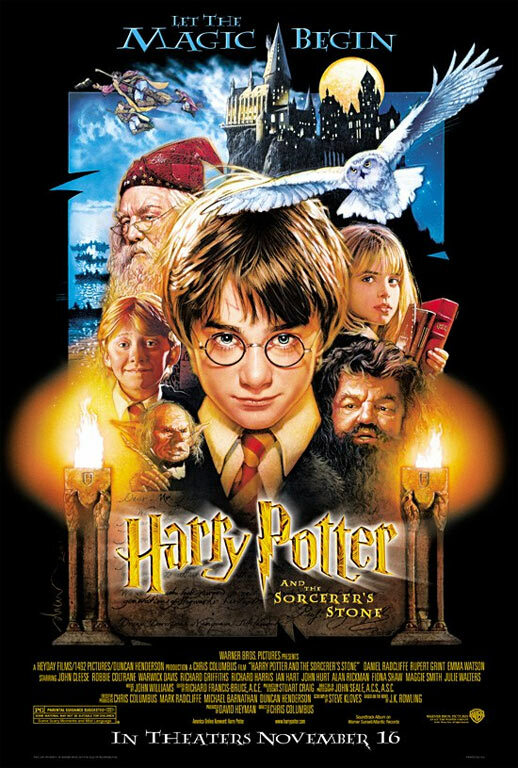 It’s iconic for good reason, and though I think these two films are a tad over-scored (his “Prisoner of Azkaban” compositions are, in my mind, much more impressive), the influence Williams has on giving “Sorcerer’s Stone” and “Chamber of Secrets” a festive flavor is undeniable. The music is big, sweeping, enveloping, and memorable, and though it’s not technically Christmas music, put it on any given Christmas mix CD and I think you could fool a number of people. The score is simply magical, the core trait of all great Christmas music, so whether or not Williams intended it this way, his music is the primary reason “Stone” and “Secrets” play amazingly well at the Holidays. As I’m writing these words, I’m listening to the track “Leaving Hogwarts” while snow is falling hard outside my dorm-room window, and all feels right with the world. 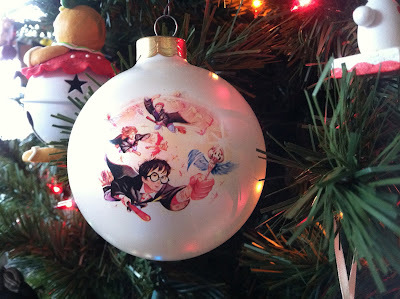 I should also note that I have a lot of Christmas-themed Potter memorabilia lying around the house. There are at least two incredible Potter ornaments on our Christmas tree – one of Hagrid, and another that is a bulb with what I believe is a Marie GrandPre illustration (she drew the pictures for the American versions of the novels). There were a lot of Christmas tie-ins with the first film, and these have proudly had a place on our tree for ten years now! If you haven’t watched “Sorcerer’s Stone” or “Chamber of Secrets” lately, now is the best time to do so. Trust me, they work best at this time of the year.